but now, I have a lot more time on my hands since Circuit City is liquidating all inventory and stores. Hmm...yes, I do work for the web-side of CC, but we are waiting to hear of it's fate since the brand and the web itself still need to be sold...it could take months before we hear anything. At this point, all associates have been given the same 60-day notice that as of March 21st, we will be "officially unemployed". I say "officially" because technically, I currently am unemployed because I have not worked since January 16th. I was one of hundreds of associates (including my husband) that were told not to come back- the old "don't call us, we'll call you". *sigh* I loved working for Circuit City. I hate shopping at Best Buy. No, it's not because I worked at Circuit City...I never shopped at Best Buy before I worked for Circuit. I just don't like it. I am hoping that the .com makes it. Keep your fingers crossed. Other news- I have had an interview which I think went well. It was with GSI Commerce up near Philadelphia (King of Prussia area). Yes, this would mean a move in the future if I were lucky enough to actually get the job. We pretty much are resigned to the fact that we are going to have to move in order to find a job...it makes me sad because I love our house. We have only been in it a year and a half. We looked for a house longer than we actually have been homeowners. I don't want a stranger living in our house. I'm going to try to not think about it. So, how have we been filling our newly-found free time? Honestly, we haven't been doing a whole lot of anything. We have been trying to save money, which means cutting back on pretty much everything. I have been doing a lot of suit shopping, which is now at a blissful end. We spent Sunday (after getting up around noon) hanging around Monument Ave getting some photos in...I am becoming obsessed with documenting some of our favorite places/things/etc. just in case we do have to move. Again, it's sad. I'm sad, and I don't want to talk about it, so here are a couple of the best pics from the shoot. 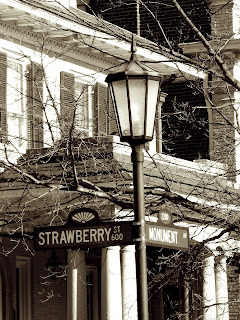 Strawberry Street and Monument- two of our favorite streets. Monument is a tree-lined avenue that is just the most amazing place to walk- and it hosts the best Easter parade ever! Strawberry Street is home to one of our favorite restaurants- Strawberry Street Cafe, a fan tradition. We highly recommend it. 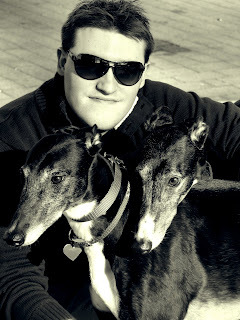 My handsome hubby and our two beautiful greys...my family. Hope you get to stay in RIC. But we'll come visit you wherever you move. i'm keeping my fingers crossed for you. who knows. maybe a move will be good. doesn't have to be forever. i know i'll eventually move back to what i call home. it won't be now, but it's out there. you never know. just take care of yourself, your hubby, and those lovely hounds.